Wendy Allyn was raised as any good adventure and music-loving troubadour would be, born in Hollywood, CA and a childhood shared between Southern California and Oklahoma City. She writes songs that search for home; the kind of melodies where truth, compassion, playfulness, kindness and a childlike curiosity are nurtured. 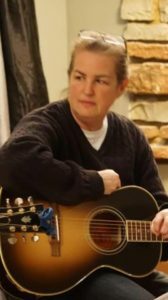 Wendy’s songs yearn for a world that truly practices the ideas of Woody Guthrie, where social justice is seen and felt in the lives of every person. She has a passion for nature and is deeply concerned for animals and the environment. When you listen, you will find her traveling through dreams and hopes, exploring characters from hard times and better times, wandering towns on this ever-changing road of life, finding her roots simply… in music.